3-13-11: THE BANNER AD ISSUE JUST REPORTED IS NOW CORRECTED. ADS ARE NO LONGER DISRUPTING APP FUNCTIONS. WE APOLOGIZE FOR ANY DISRUPTION FROM THESE ADS. THIS WAS AN ERROR STEMMING FROM THE BANNER AD COMPANY WE USED FOR SLEEP MACHINE LITE AND HAVE COMPLETELY SHUT ALL BANNER ADS OFF. I can't hear "Spaceship " on the sample track? Does it work ? Yes they do work. There are a couple of sounds on Sleep Machine that are of a lower frequency for excellent bass response. They create a warm comforting sound as well as drown out low frequency sounds that may disturb your sleep from surrounding noises such as neighbors, street noises, etc. These sounds are Spaceship, Furnace, and Heartbeat. These sounds work well with headphones and external speakers and or a dock. 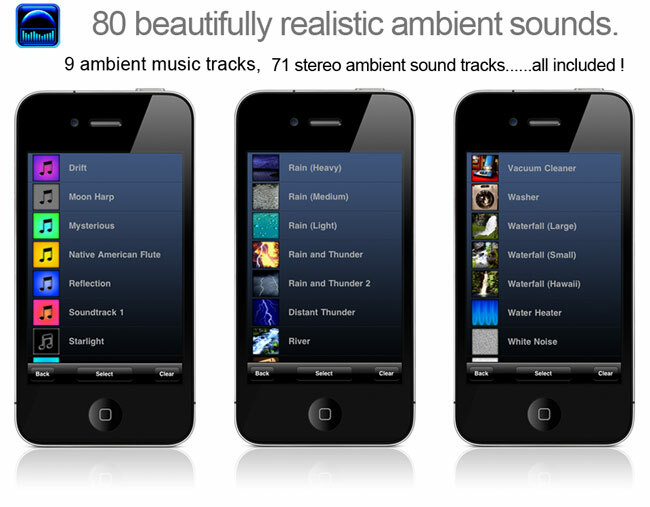 As with any audio based application for the iPod/iPhone/iPad including the iPod Music, we recommend using external speakers and or headphones to take advantage of the high quality sounds of Sleep Machine including the " stereo " spacing inherent with our mastered sounds and or music from your favorite artists. The sounds stopped playing ? There can be any number of reasons this may happen to any app or situation. Rebooting your device should solve any such anomaly. I upgraded to Sleep Machine from Sleep Machine Lite, why aren't there any of the new sounds on Sleep Machine Lite after upgrading? When you upgrade to the full version of Sleep Machine, you are downloading a new app altogether. After the download is complete, scroll thru all of your apps and you should see the icon for " Sleep Machine ". That is the new app you just purchased. If you have any questions or comments, please contact us at info@sleepsoftllc.com. We want to hear from you. We will always respond to your questions and comments and you can help make Sleep Machine the best app it can be. *NEW ! - Choose your favorite iPod music or playlist of songs to wake up to ! *NEW ! - Enhanced Timer functionality. Added ability to program length of timer sounds from 10 seconds to infinity. Added Auto Repeat option perfect for meditation sessions! *NEW ! 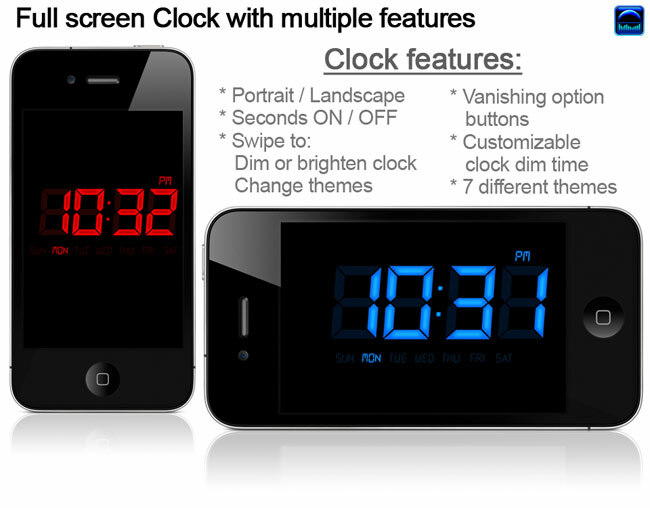 - Enhanced Clock with vanishing option buttons for a clean clock look. Touch the clock screen and the option buttons reappear. *NEW ! - Enhanced graphics for Retina Display, perfect for the new iPod Touch and iPhone 4. Upgrade to the all new Sleep Machine 3.0! 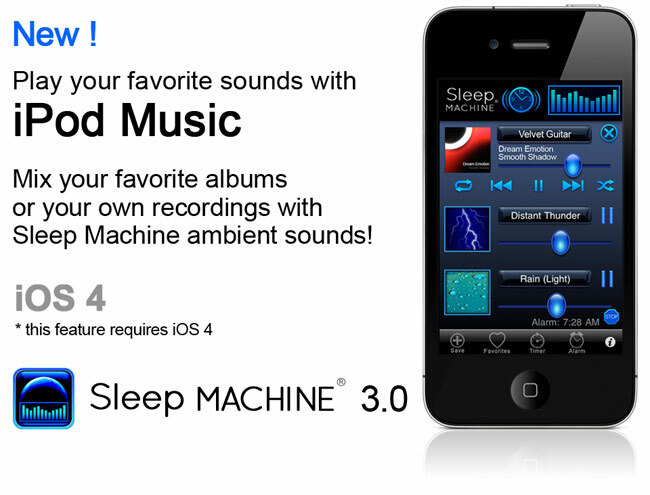 Sleep Machine is a professional ambient sound and white noise player that helps you sleep or relax. With it's uniquely elegant multi sound player design, it's easy to create a truly lifelike sound experience and relaxation ambiance. Mix in your favorite iPod Music ! 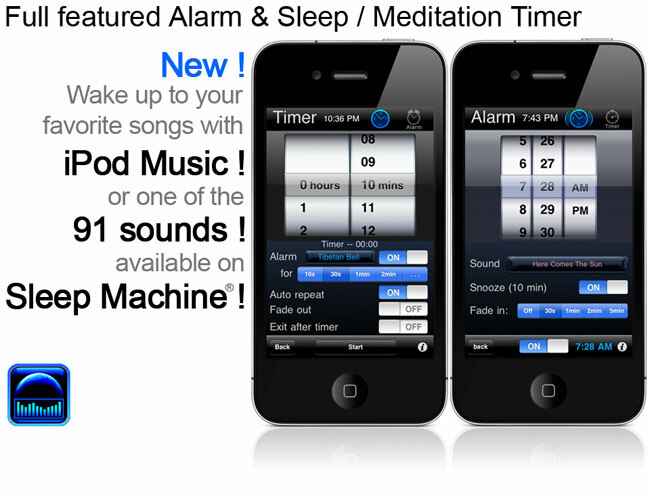 With it's full-featured alarm clock and sleep / meditation timer, you can time your sessions to fall asleep and set your alarm to wake up to Sleep Machine's huge assortment of 91 high quality "stereo" ambient sounds. You can wake up to your favorite iPod music or even full playlist of multiple songs too! Sleep Machine is perfect for sleeping, concentration, relaxation, meditation, yoga, napping, noise masking, or just having fun mixing real sound environments and or your favorite music together. - Play 1 or up to 3 sounds simultaneously to create the perfect sound atmosphere. - Save any of your favorite combination creations with individual volume settings. - Choose your favorite iPod music or playlist of songs to wake up to ! Bells 1, Bells 2, Buzzer 1, Buzzer 2, Child Laughing, Dog Bark, Guitar Strums, Harmonics, Harp, Tibetan Bell, Train Bell.
" To put it mildly this is one of the best apps ever made! The ability to mix 3 different sounds vary the volume of each is fantastic. This app has helped me manage my insomnia and drown out my noisy family at bed time! " " I am completely addicted to this application, and use this to sleep better every night. I live in a big city, and we have an often-crying newborn baby in the apartment next door. We plug an iPhone into a logitech speaker unit and use the fan noise to sleep more soundly every night. " " I've tried a few sleep apps and feel that Sleep Machine is the best for me. I enjoy the various quality sounds and the ability to combine them to fit my mood. I really like the new sounds they recently added. It's even good just to unwind with for a few minutes. Very soothing! " " I love this app! combining different sounds gives you an experience that you can get from traditional, more expensive sound machine. also, I love that you can save your combinations! and, you can set a timer and then it just goes off and you iPod goes to sleep. fan-friggin-tastic! but this! " " This app made me realize just how reliant on my iPhone I really am. No longer do i need the fan on all night to sleep well. The name of the app is self-explanatory: I sleep like a baby : ))) "
" This is a great little app. I especially like the ability to mix sounds, each with their own level control. I use it quite a bit because it's very good for masking noise at any time of the day. " " This app is amazing! I love how you can mix them and I have found the perfect sound that I could never get in real life. " See and hear for yourself why Sleep Machine is simply the best customizable relaxation, sound atmosphere, and alarm clock application available for your iPhone or iPod Touch. Try Sleep Machine TODAY.